It is the author's contention that ‘nature’ is a wonderful resource and vehicle for teaching students at all levels about mathematics, be it qualitatively at elementary schools (shapes, circular arcs, polygonal patterns) or more quantitatively at middle and high schools (geometrical concepts, algebra, trigonometry and calculus of a single variable). This was the motivation for writing A Mathematical Nature Walk (as well as the somewhat more advanced Mathematics in Nature). Within the realm of nature the subject of meteorological optics is a particularly fascinating one; it includes the study of the rainbow as well as others such as ice crystal halos and glories. 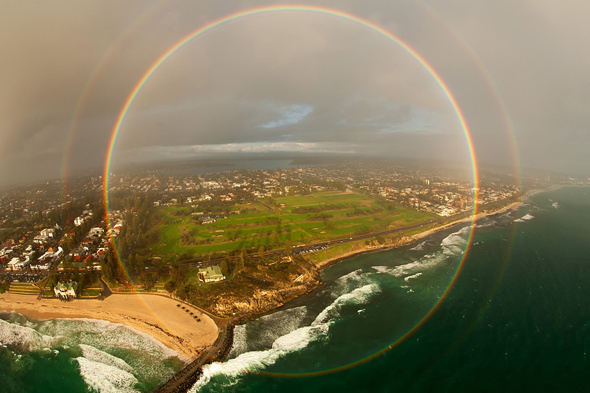 Obviously there is some physics involved in the explanation of these phenomena, but fortunately it is not necessary to go into a lot of physical detail in order to appreciate the value of geometry, trigonometry and high-school calculus concepts used in modeling the beautiful rainbow arcs in the sky. For students in elementary school there is a variety of angle-based concepts that can be addressed when discussing rainbows. Thus, ‘solar altitude’ is the angle the direction to the sun makes with the horizontal, just as the direction to the top of a tree makes an angle with the direction of its shadow on the ground (in fact that angle is exactly the solar altitude!). By making a large paper cone to mimic the ‘rainbow cone’ and varying the angle at which students hold it, (Figure 3), they will see that if the sun is very low (i.e. close to the horizon), then the rainbow arc is almost a complete semicircle, whereas if the sun is too high (altitude greater than 42o), then the top of the rainbow is below the horizon and therefore not visible (unless the observer is on a hill or in flight; see http://www.slate.com/content/dam/slate/blogs/bad_astronomy/2014/09/01/circular_rainbow.jpg.CROP.original-original.jpg). If the student (or anyone!) is fortunate enough to see a nearly semicircular rainbow, then the angle between the two ‘ends’ of the rainbow and the observer – its ‘angular diameter’ – is twice 42o, which is not far from a right angle! What about middle-school students? In the summer of 2015 I was privileged to teach a dozen specially selected 6th – 8th grade students in the Virginia STEAM Academy at Old Dominion University. The acronym refers to Science, Technology, Engineering and Applied Mathematics. The topics covered included rainbows, ice crystal halos, water waves, glitter paths and sunbeams; additionally, the topics ‘Guesstimation’ (i.e. back-of-the-envelope problems that require estimation) and ‘dimensional analysis’ (i.e. what happens as things get bigger?) were incorporated into the week-long class. Given that the mathematical background of these students included algebra, geometry and trigonometry, much of the material discussed in this article was covered, and the results from the calculus-based topics were presented qualitatively (and very successfully) by engaging the students on their understanding of maxima and minima, and applying those ideas in this context. in terms of the angles of incidence (i) and reflection (r) respectively (see Figure 1 where the incident ray is refracted and reflected inside the spherical drop; Figure 2 illustrates the ray path for the secondary bow). But what is this angle? Essentially it is the direction through which an incoming ray from the sun is ‘bent’ by its interaction with the drop to reach the observer’s eye (the reader is referred to the caption for Figure 1 for more details). Figure 1. The path of a ray inside a spherical raindrop which, along with myriads of other such drops, contributes to the formation of a primary rainbow (k = 1). The deviation angle D(i) referred to in the text (see equation (1)) is the obtuse angle between the extension of the horizontal ray from the sun and the extension of the ray entering the observer’s eye. Its value is approximately 138o. Its supplement, 42o, is the semi-angle of the ‘rainbow cone’ in Figure 3. Figure 2. The corresponding ray path for the secondary rainbow, arising because of a second reflection within the raindrops. The angle of refraction inside the drop is a function of the angle of incidence of the incoming ray. This relationship is being expressed in terms of Snell's famous law of refraction, namely sini = nsinr, where n is the relative index of refraction (of water, in this case). This relative index is defined as the ratio of the speed of light in medium I (air) to the speed of light in medium II (water); note that n > 1; in fact n ≈ 4/3 for the rainbow, but it does depend slightly on wavelength (this is the phenomenon of dispersion, and without it we would only have bright ‘whitebows’!). The article by Austin & Dunning (1991) provides a helpful summary of the ‘calculus of rainbows,’ as does the even briefer ‘Applied Project’ in Chapter 4 of Stewart (1998). or directly differentiate the expression (3) and equate it to zero to find the critical angle ic from the resulting expression below, i.e. Thus, with a generic value for n of 4/3, ic ≈ 1.04 radians, or about 59.4o for the primary bow. So, D"(ic) > 0 as indicated. Note that in this instance it was not necessary to specify ic so the result is a global one, i.e. the concavity of the graph of D(i) does not change in [0, π / 2], the interval of physical interest. This result is established using exactly the same method to arrive at equation (6). For the primary bow (k = 1) this reduces (as it should) to equation (6) above. Additionally, equation (9) reduces to equation (3) for k = 1 since k(k + 2) = 3.
it is possible to write cos[D(ic)] in terms of sin A, cos A, sin B and cos B, each of which can be found easily from the definitions of A and B in equation (12). The result is a rather nasty expression which can be reduced algebraically to equation (11). Voilà! This has been generalized to higher-order bows (see Adam 2008), but it would take us too far afield to describe here; essentially the same ideas are involved. The supplement of this angle (≈ 42o) is the semi-angle of the rainbow ‘cone’ formed with apex at the observer's eye, the axis being along the line joining the sun to the eye, extended to the antisolar point (see Figure 3). Figure 3. The ‘rainbow cone’ for the primary rainbow. For the secondary bow (k = 2) the cone semi-angle is approximately 51o, as may be calculated from equations (9) and (10). Figure 4. The graph of the deviation angle D(i) for the primary bow from equation (3) as a function of the angle of incidence (both in radians). Note that the minimum deviation of approximately 2.4 radians (≈138o) occurs where the critical angle of incidence ic ≈1.04 radians (≈ 59.4o). These values may be calculated directly using equations (3) and (6). The graph shows that above and below ic there are rays deviated by the same amount (via the horizontal line test), indicating that at ic these two rays coalesce to produce the region of high intensity we call the rainbow. So what happened to the colors of the rainbow? They have of course been there all along, and all we need to do is to utilize the fact that the refractive index n is slightly different for each wavelength of light. Blue and violet light get refracted more than red light; the actual amount depends on the index of refraction of the raindrop, and the calculations thereof vary a little in the literature, because the wavelengths chosen for red and violet may differ slightly. Thus, for red light with a wavelength of 656 nm (1 nm = 10–9 m), the cone semi-angle is about 42.3o, whereas for violet light of 405 nm wavelength, the cone semi-angle is about 40.6o an angular spread of about 1.7o for the primary bow. (This is more than three times the angular width of a full moon!) The corresponding values of the refractive index differ very slightly: n ≈ 1.3318 for the red light and n ≈ 1.3435 for the violet – less than a one percent increase! Similar (though slightly wider) dispersion occurs for the secondary bow, but the additional reflection reverses the sequence of colors, so the red color in this bow is on the inside edge of the arc. In principle more than two internal reflections may take place inside each raindrop, so higher-order rainbows, i.e. tertiary (k = 3), quaternary, (k = 4) etc., are possible. Each additional reflection of course is accompanied by a loss of light intensity because of transmission out of the drop at that point, so on these grounds alone, it would be expected that even the tertiary rainbow (k = 3) would be difficult to observe or photograph without sophisticated equipment; however recently several orders beyond the secondary have been identified and photographed (see the cited articles by Edens, and Edens & Können). The reader’s attention is also drawn to the superb website on atmospheric optics, in particular the following link: http://www.atoptics.co.uk/rainbows/ord34.htm. It is possible to derive the angular size of such a rainbow after any given number of reflections using equations (9) and (10) (Newton was the first to do this). Newton’s contemporary, Edmund Halley, noted that the third rainbow arc should appear as a circle of angular radius nearly 40o around the sun itself. The fact that the sky background is so bright in this vicinity, coupled with the intrinsic faintness of the bow itself, would make such a bow almost, if not, impossible to see or find without sophisticated optical equipment. Exercise for the student: Use the generic value for the refractive index of water, n = 4/3, in equations (9) and (10) to show for the tertiary rainbow (k = 3) that ic ≈ 70.6o and D(ic) ≈ 321o, so the ‘bow’ is at about an angle of 39o from the incident light direction. In fact, this will appear behind the observer as a ring around the sun! Exercise for the student: Calculate the angular width subtended at the eye by a ‘baby aspirin’ held at arm’s length. Then see if you can ‘cover’ the full moon by extending your arm while holding the aspirin! Have you ever noticed a rainbow-like reflection from a road sign when you walk or drive by it during the day? Tiny, highly reflective spheres are used in road signs, sometimes mixed in paint, or sometimes sprayed on the sign. Occasionally, after a new sign has been erected, quantities of such ‘microspheres’ can be found on the road near the sign (see http://apod.nasa.gov/apod/ap040913.html for an excellent picture of such a bow). I have had my attention drawn to such a find by an observant student! It is possible to get samples of these tiny spheres directly from the manufacturers, and reproduce some of the reflective phenomena associated with them. In particular, for glass spheres with refractive index n ≈ 1.51 scattered uniformly over a dark matte plane surface, a small bright penlight provides the opportunity to see a beautiful near-circular bow with an angular radius of about 22o (almost half that of an atmospheric rainbow). In such an experiment this bow appears to be suspended above the plane as a result of the stereoscopic effects because the observer’s eyes are so close (relatively) to the spheres compared with passing several yards from a road sign. More details of the mathematics can be found in the article by Crawford (1998) and Chapter 20 of Adam (2012). Related topics in meteorological optics. Note that in the list of topics below each meteorological phenomenon can be examined as a topic in mathematical physics because the subject of optics is very mathematical. At times, it required very sophisticated mathematics. The author recommends another enrichment activity in which students search for each of the topics (and others) below on the ‘Atmospheric Optics’ website mentioned above: http://atoptics.co.uk/. There is a vast selection of topics (with many photographs) to choose from, including shadows, ice crystal halos around the sun or moon, ‘sundogs,’ reflections, mirages, coronas, glories, sun pillars as well as, of course, rainbows. The advantage of this site (and its ‘sister’ site, Optics Picture of the Day (OPOD: http://atoptics.co.uk/opod.htm)) is that students at all levels, elementary, middle and high school, will be able to find material of interest to them. These sites are replete with straightforward physical explanations and illustrations of the phenomena, but there is little, if any, mathematical discussion so they can be appreciated in a scientifically accurate way by students at any level of mathematical proficiency. The book A Mathematical Nature Walk, together with the more advanced Mathematics in Nature cited in the bibliography, can provide a starting point for both teachers and students interested in pursuing some of the mathematical aspects of these phenomena. As a further example, a very brief description of glories (with an associated ‘student teaser’) is provided below. Although ice-crystal halos are only briefly mentioned in the preceding paragraph, students at all levels can be encouraged to look for them. These can appear around the sun or full moon with surprising frequency (though it must be emphasized again that you should never look directly at the sun; block it off with your hand or a convenient chimney!). They are formed by sunlight passing through myriads randomly oriented, nearly regular hexagonal prismatic ice crystals, composing cirrus clouds, the very highest type of cloud we generally see (during the day at least). In distinction to rainbows, the most common halos are smaller in angular radius (about 22o as opposed to 42o) and exhibit a reddish tinge on the inside of the arc – a reversal of colors compared with the primary bow. This is because, unlike the mechanism producing the primary bow, there is no reflection occurring within the crystals to produce these particular halos, only refraction. I live about a mile from Old Dominion University and walk to my office; as a result I generally see such halos (and other types also) several times a month; sadly, far more frequently than I witness rainbows. On an otherwise clear night, a full moon embedded in a thin cirrus cloud may exhibit similar such halos, which can be quite prominent by virtue of the moon being so much less bright than the sun. Indeed, I have frequently been contacted by friends and students who witness the latter but have never noticed a halo around the sun! Exercise for the student: Imagine a regular hexagonal prism with a light ray entering side ‘1’, and exiting side ‘3’ (see the Atmospheric Optics website for more details and its interactive ‘mouse’ tasks to discover the minimum angle of deviation for both rainbows and halos). Using the same geometric, trigonometric and calculus concepts applied to rainbows in the body of the article, show that the minimum angle of deviation for such rays is about 22o, the angular radius of the most commonly visible halo. Mountaineers and hill climbers have noticed on occasion that when they stand with their backs to the low-lying sun and look into a thick mist below them, they may see a set of colored concentric circular rings (or arcs thereof) surrounding the shadow of their heads. Although an individual may see the shadow of a companion, the observer will see the rings only around his or her head. They may also be seen (if you know where to look) from airplanes. This is the meteorological optics phenomenon known as a glory. Cloud droplets essentially ‘backscatter’ sunlight back towards the observer in a mechanism similar in part to that for the rainbow. The glory, it is sometimes claimed, is formed as a result of a ray of light tangentially incident on a spherical raindrop being refracted into the drop, reflected from the back surface and reemerging from the drop in an exactly antiparallel direction (i.e. 180o) into the eye of the observer, but this is actually incorrect (see the ‘student teaser’ below). Student teaser: Why is the ray path allegedly associated with the formation of a ‘glory’ as illustrated in Figure 5 (and in some meteorology textbooks) incorrect? Use equation (3) to investigate this. Figure 5. An incorrect ray path explanation for the glory. This article presents some of the basic mathematical concepts and techniques undergirding a relatively common (and beautiful) phenomenon in meteorological optics. The analysis presented here does not contain new mathematics; it can be found from many sources because the subject of meteorological optics has been around for a very long time! What is emphasized, however, is the presentation of these ideas as a potential enrichment topic for (i) ‘qualitative’ mathematical modeling in elementary classrooms and (ii) more quantitative approaches in middle and high school classrooms. It should also be noted that the many more subtle features associated with these and other optical effects in the atmosphere require far more powerful and sophisticated mathematical tools to explain them. Nevertheless (though space does not permit it), aspects of the above-mentioned phenomena of ice crystal halos and glories may also be discussed at the level presented here. More details may be found in the references listed. It is hoped that this article will also ‘whet’ the appetite of interested instructors and students to pursue these aspects in more detail. A further suggestion may be made. The website Earth Science Picture of the Day (EPOD: epod.usra.edu), which is a service of the Universities Space Research Association (USRA), publishes photographs from a variety of subject areas: geology, oceanography, space physics, meteorological optics, agriculture, and many more. Anyone is invited to submit their photograph of an interesting optical or geological phenomenon, and is encouraged to write a short summary for the layman explaining the picture and, where possible, the basic science behind it. A recent submission by the author (August 15th, 2016), for example, uses simple proportion to estimate the height of a tree canopy using the ‘pinhole’ elliptical patches of light cast on the ground by gaps in the leaves of the tree (http://epod.usra.edu/blog/2016/08/estimating-tree-height-using-natural-pinhole-cameras.html). For a propos that is the topic of this article, see http://epod.usra.edu/blog/2017/07/streaky-rainbow-in-zion-national-park.html. The site provides useful educational links for the daily pictures and is a valuable resource for teachers and students alike. Adam, J. A. (2006). Mathematics in Nature: Modeling Patterns in the Natural World. Princeton, NJ: Princeton University Press. Adam, J. A. (2008). Rainbows, Geometrical Optics, and a Generalization of a result of Huygens, Applied Optics, 47, H11 - H13. Adam, J. A. (2009). A Mathematical Nature Walk. Princeton, NJ: Princeton University Press. Adam, J. A. (2012). X and the City: Modeling Aspects of Urban Life. Princeton, NJ: Princeton University Press. Austin, J.D. and Dunning, F. B., (1991). Mathematics of the rainbow. In Applications of Secondary School Mathematics (Readings from the Mathematics Teacher),	271 – 275. Crawford, F.S., (1988). “Rainbow dust.” American Journal of Physics 56, 1006 – 1009. Edens, H. E. (2015). Photographic observation of a natural fifth-order rainbow, Applied Optics 54, B26–B34. Edens, H. E. and Können, G. P. (2015). Probable photographic detection of the natural seventh-order rainbow, Applied Optics 54, B93–B96. Stewart, J. (1998) Calculus: Concepts and Contexts (Single variable). Pacific Grove, CA: Brookes/Cole Publishing Company. Appendix: More mathematical patterns in nature. Tree growth rings are almost circular. In three dimensions, snail shells and many seashells and curled-up leaves are helical in shape and tree trunks are approximately cylindrical. Measuring inaccessible horizontal distances using congruent triangles. Finding the number of blades of grass in a certain area, or the number of leaves on a tree. The angles subtended by the fist, and the outstretched hand, at arm's length can be estimated and used to identify the location of "sundogs" (parhelia) and ice crystal halos on days with cirrus clouds near the sun. Why elephants are not just large mice. Furthermore, simple ideas such as scale enable us to compare, at an elementary level, metabolism and other biological features (such as strength) in connection with pygmy shrews, hummingbirds, beetles, flies and other bugs, ants and African elephants to name a few groups! Note: This appendix is adapted from A MATHEMATICAL NATURE WALK by John A. Adam. Copyright © 2009 by Princeton University Press. Reprinted by permission. Note: Figures 1, 2, 4 and 5 are reproduced from A MATHEMATICAL NATURE WALK by John A. Adam. Copyright © 2009 by Princeton University Press. Reprinted by permission. Figure 3 is reproduced from X AND THE CITY: MODELING ASPECTS OF URBAN LIFE by John A. Adam. Copyright © 2012 by Princeton University Press. Reprinted by permission. The author would like to thank the reviewers for their detailed and constructive criticism that resulted in a much improved version of the article.